The Southern Normal School was created when A.W. Mell and Tom Williams left the Glasgow Normal School and moved to Bowling Green. 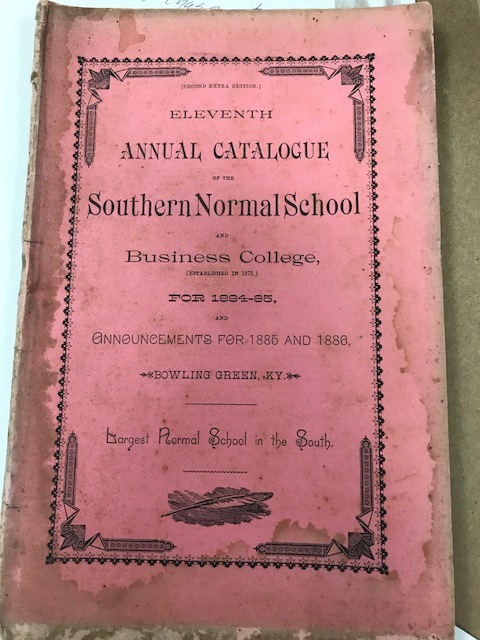 It was originally called the Southern Normal School & Business College, but in the 1886 charter the name was changed to Southern Normal School. From 1890-1892 the school went through a succession of management changes being overseen by H.A. Evans, W.J. Davis, J.R. Alexander and H. McD. Fletcher. It came into the hands of Henry Cherry and his brother Thomas in 1892 with yet another name change. On November 16, 1899 the school was destroyed by fire. Because of this, WKU Archives has very little in the way of records from the school. This 68 page catalog covers such topics as the history of the school, expenses, literary societies, hints, social features, directory of teachers and directory of alumni. In 1899 the Southern Educational Building Company was incorporated with a purpose “to promote and advance education by providing essential buildings, including dormitories.” [Harrison, Western Kentucky University, p. 10] After the 1899 fire Henry Cherry rented rooms and opened the school for business the next day. A new building was constructed by 1901. The school remained in operation as Southern Normal School until the state legislature established the Western Kentucky State Normal School in 1906. Please contact WKU Archives if you have Southern Normal School materials or photographs you are willing to donate.